It is our goal to help you prevent your domain name registration from being moved to another company by deception or misinformation. If you receive mail that appears to be an invoice, which is in fact a solicitation for business, you may be the target of a fraudulent or false invoicing scheme. What should I do to avoid being tricked by the false invoices? 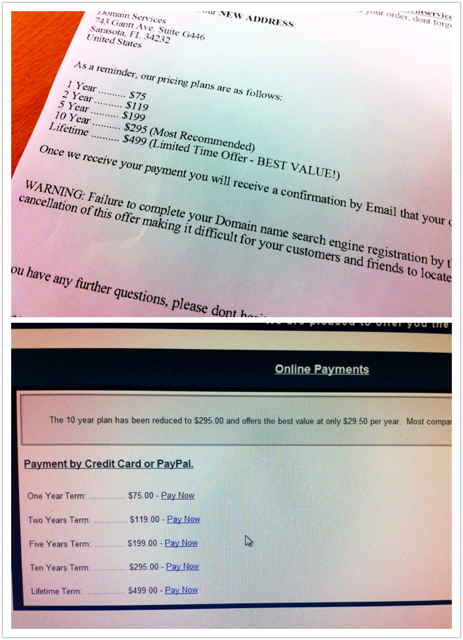 The best way to combat this is to simply contact us in regards to your domain renewal. Also, you may consider choosing Private Registration and Domain Locking when signing up a domain with us. With Doteasy’s Private Registration, we will replace your domain WHOIS record contact information with alternative contact information that we use specifically for this service. Private Registration can greatly reduce your chances of receiving spam mail and emails. As for Domain Locking, you have total control over the safety of your domain name. You can choose to lock your domain name to prevent unauthorized or accidental transfers, or you can unlock your domain name when you need to move it to another registrar. These two safety features can prevent your website from malicious domain transfers. For more info, please read these pages in regards to Doteasy’s Private Registration and Domain Locking.